IPEC had received an order from European company Viru Keemia Grupp for slate waste treatment plant in April 2017. The agreement was made for the manufacturing of the complex based on two Continuous Thermal Decomposition Plants, brand name TDP-2-2000, with a productive capacity of 1500 kg of slate coal-tar waste per hour each. Fine quality pyrolysis plant was sent to the Customer just 3 months after signing the contract. 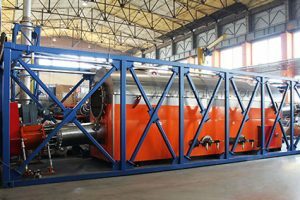 Acceptance of the equipment was based on trial operation runs of the unit at the IPEC workshop. Recall that equipment and IPEC’s production area are certified by TÜV Nord specialists and meet the requirements of the European standards, in particular the Directive ‘On the Safety of Machinery and Equipment’ (2006/42/EC).